The Chandrakhani Pass Trek brings a fascinating trekking route that is devoted to a great legend and offers some great views of Deo Tibba and the Pin Parvati range of mountains. The legend takes anyone far behind thousands years ago; when Jamlu (the presiding deity of Malana) was carrying a basket containing Gods of Kullu. On the top of the pass when he opened the basket, a very strong wind blew the Gods all over the Kullu valley to their present abodes what the people can find then today at their respective temples. Since then the valley is known as the Valley of Gods. The Malana Village is a strong visual of culture in itself where the old traditions are still adhered. Likewise, the Chandrakhani Pass pass is known for the beauty it possesses and is a decent base for making a trek journey. Chandrakhani is 3600m above sea level and offers magnificent sights while on the trial along with the marvelous sights of the Deo Tibba peak, Pir Panjal and Parbati mountain ranges. The trek normally starts from the village of Naggar located just 21 kms away from the town of Manali. The sight of Pir Panjal range to the North and the smaller Shivaliks to the South is quite potent from this Pass. The Chandrakhani Pass trek can be categorized as mild trekking that provides an excellent insight into the traditions of this valley apart from some great outdoors. In the evening drive to Manali by AC Volvo coach. Overnight journey. Arrival at Manali by morning and then transfer to hotel for relax and acclimatisation. At leisure visit Hadimba Devi Temple, old Manali and the Mall road. Dinner and overnight stay in the hotel. Early morning drive to Naggar (21 kms). From Naggar the trail leads past Roerichs cottage and along the main bridle path for 1 km before branching uphill to the village of Rumsu. There is an ancient wooden temple with close ties to the temples dedicated to Jamlu in Malana. From Rumsu head up the ridge to the east of the village and follow a well defined trail through a forest of deodar, pine and horse chestnut, Trek further to reach Ganachalani. Dinner & overnight stay in tents. This day we will start early to reach Pass in order to enjoy magnificent views. Its an hour trek to the pas from Cerlanti. From celanti trek to ridge line and cairns that defines the Chandrakhani pass. There are impressive views to the north, including the Ghalpo Peaks of Lahaul- Dharamsura (6446 m) and Papsura (6451 m) and the other high peaks in the upper Tosh valley, while the snow capped ranges of the Himala extend to the head of the Parvati Valley. From the pass the trail to Dadru remains about 100 meters below the ridgeline for a further 2-3 kms. 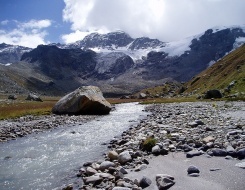 It descends to the meadow at Nagarvani (3350m). From Nagarvani a couple of river crossings and passage through the forest of silver fir and oak leads to the village of Dadru. Dinner & overnight stay in tents. Take a half day sight seeing and in the evening drive to Delhi by AC Volvo coach. Overnight journey. Arrival at Delhi by morning and from here transfer to hotel for relax. In the evening drive to airport to catch onwards flight. Trip & services ends here. • Accommodation: Hotel at Manali with Bed and Breakfast basis. While on trek dome/alpine tent, carry mat, kitchen tent, stool etc will be provided. • Transport: AC Volvo coach from Delhi – Manali and Manali to back. Tata Sumo/Toyota Qualis from Manali – Trek point and back. • Meals: at Manali only breakfast will serve. Trek: On the trek all meals will be provided. Meal will be mix of Indian, Chinese & Continental. • Porters: For carrying camping equipment, rations, vegetables and some amount of personal gear of the clients (one bag not weighing more than 15 kgs). • Professional local trekking guide & cook would accompany you.